I love chatting skincare with fellow skincare enthusiasts and when given the opportunity to pick the brain of the La Prairie Education Executive in a lounge while eating macarons dedicated to the launch of a fabulous new $900 brightening daily moisturizer, you do not say no! 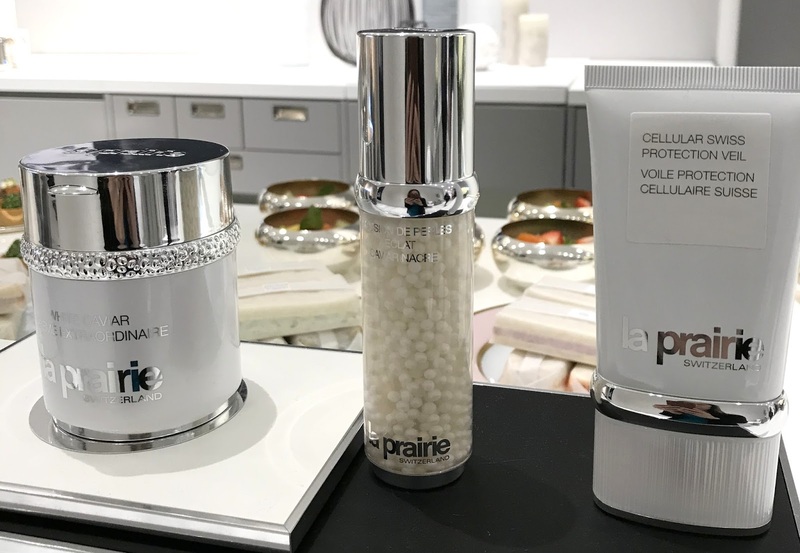 From March 15-31st, La Prairie has been hosting a pop-up lounge at Holt Renfrew to celebrate the launch of White Caviar Creme Extraordinaire! 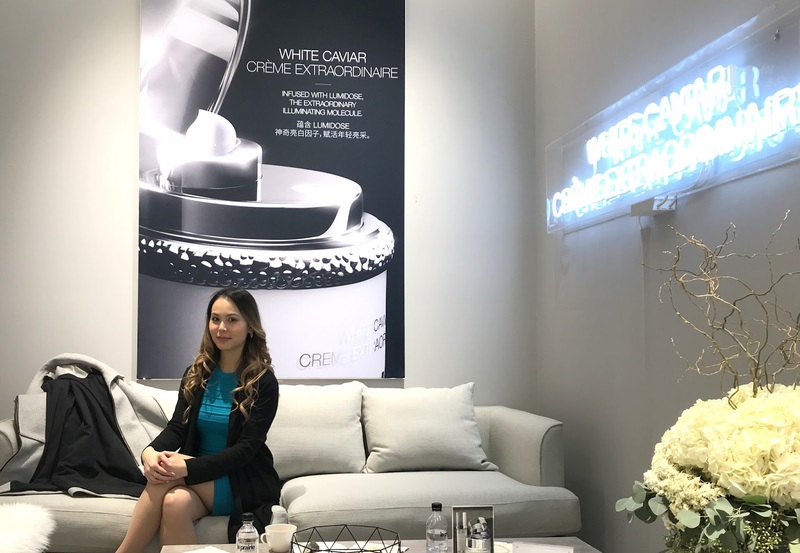 This lounge is open to the public and filled with Insta-worthy activities and beauty treatments ranging from a quick 5-10 minute hand massage or illuminated eye treatment to a 45 minute mySkin dermograph consultation or White Caviar Facial Treatment (by appointment)! 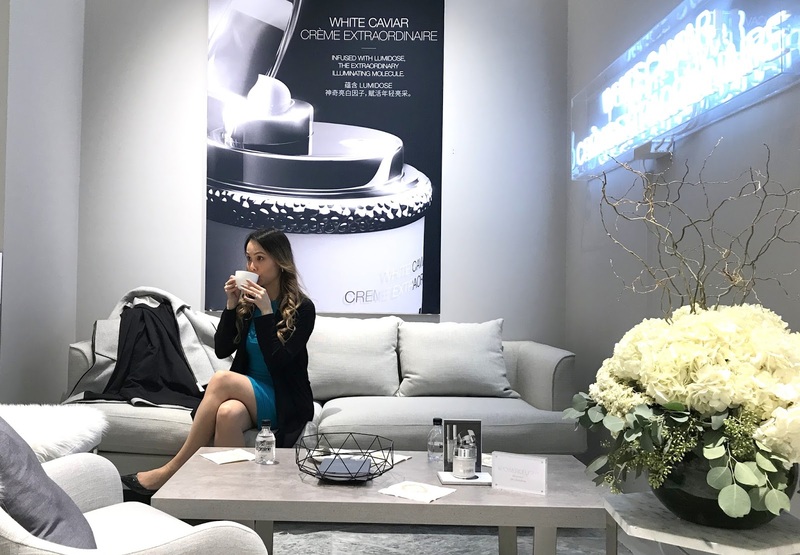 The lounge is located right at the back of the beauty hall so you can relax and experience the White Caviar Creme Extraordinaire in a more quiet environment away from the hustle and bustle of shopping. Eric Wang, the La Prairie Education Executive, gave me a tour of the lounge which was much larger than I thought! 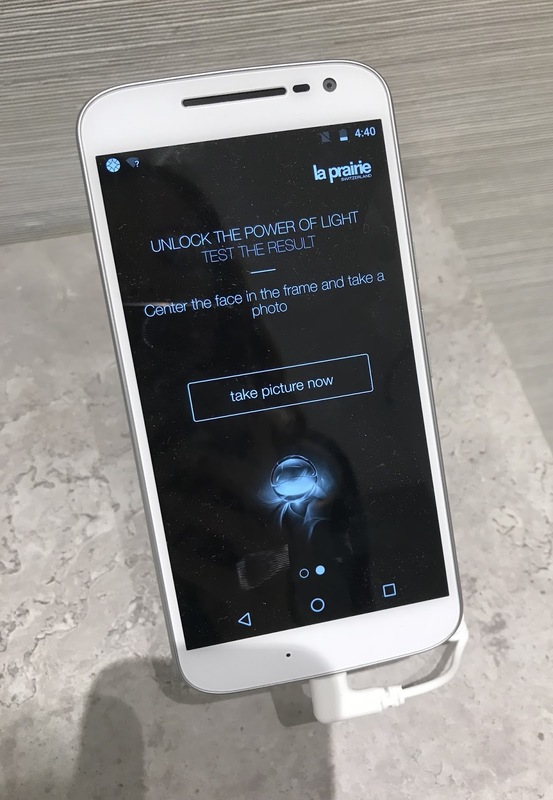 He, of course, also told me all about how this brand new moisturizer worked and that it uses a patented active called Lumidose, which inhibits melanin production. 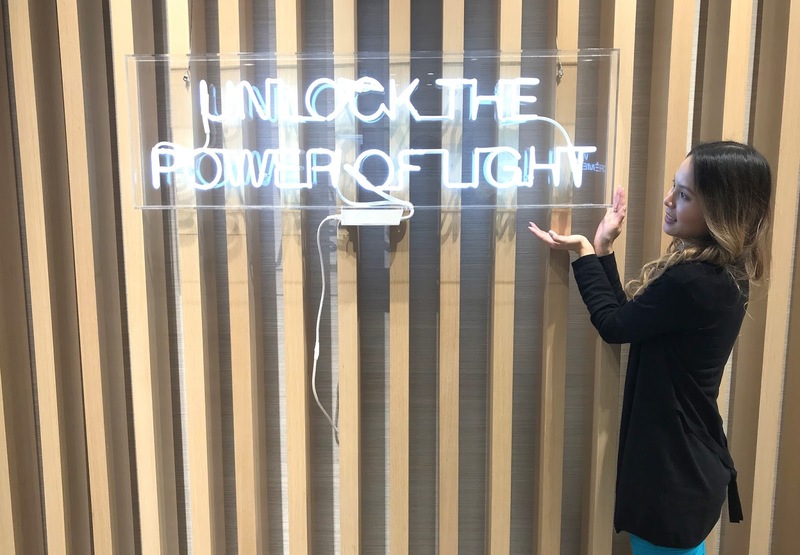 This causes dark spots or age spots to diminish over time while bringing "light" back to dull and lackluster skin. Then, I distracted him with questions about ingredients, dimethicone and green beauty which he happily answered! I was also quite pleased to find out that Eric has a degree in Biochemistry which explained why his answers were so much more succinct and informative than the usual skincare jargon! Thumbs up Eric for knowing your stuff! 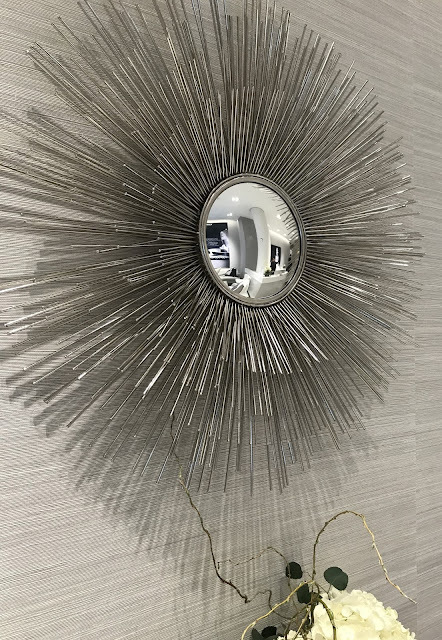 I tried to take a photo of the entire lounge in panoramic style, but there was a high tea for VIP clients about to start the Saturday afternoon I was there so there was quite a bit of activity by the time I got to picture taking! Right at the entrance of the lounge are a couple of phones loaded with the La Prairie app where you can take a picture of your face with dullness, dark spots and/or hyperpigmentation and then fast forward 8 weeks later to how your skin is *hopefully* going to look like after using the White Caviar Creme Extraordinaire! I just liked this mirror. Nothing more LOL. You can tell I'm not a fashion blogger because I honestly look concerned while nonchalantly drinking my tea. It was English Breakfast in case you were wondering! There were personalized White Caviar stations where you could sample the products and experience them on the hands or face. If you saw my Instagram stories, I was PSYCHED about the way this product is dispensed. 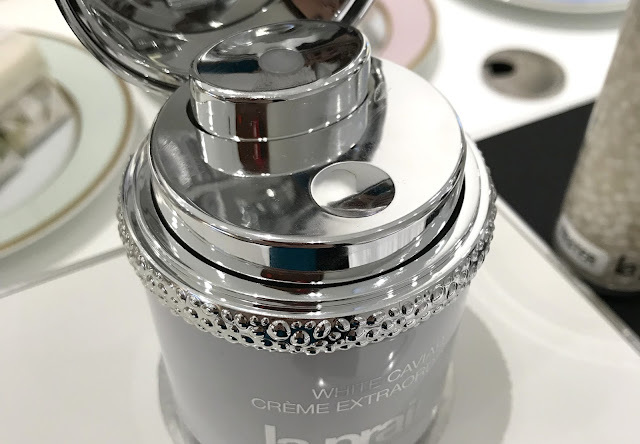 Yes, it looks a little bulky, but I have to hand it to La Prairie for making a pump that gives you the perfect amount of moisturizer for your face AND keeps the remaining product in the container virtually sealed off from contamination! And how did this cream feel? Incredibly cool, creamy and comforting. One pump was enough for BOTH the tops of my hands so I know my face will be covered and of course the scent was just heavenly. If you have never smelled La Prairie products, they have a signature scent which smells luxurious, but totally approachable because all you want to do is douse your entire body with it! If this scent came in a fragrance or candle, I would have it all over my apartment! I was given the Cellular Swiss Protection Veil when it first launched and it is a wonderful daily moisturizer with built-in environmental shielding. I believe there is chemical SPF in here (ethyl methoxycinnamate), but you know how we are in Canada with our SPF and treating it like a drug so legally nothing can be said until this product has a DIN number. I have a long awaited review for this product so I won't share TOO much about it, but suffice it to say, it's the only "sunscreen" you will wear that will make your skin actually look better! 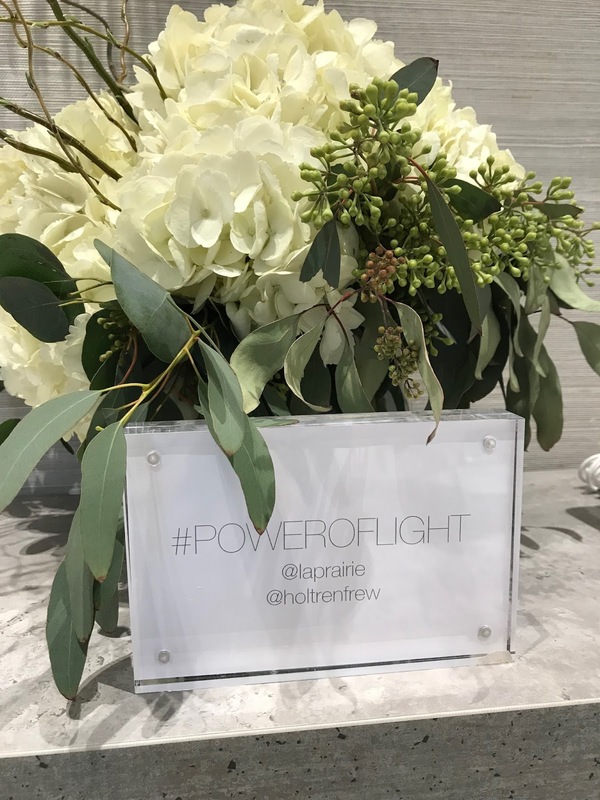 This is the last week of the La Prairie x Holt Renfrew lounge so please head on over and enjoy some quiet time and a luxury skincare experience! 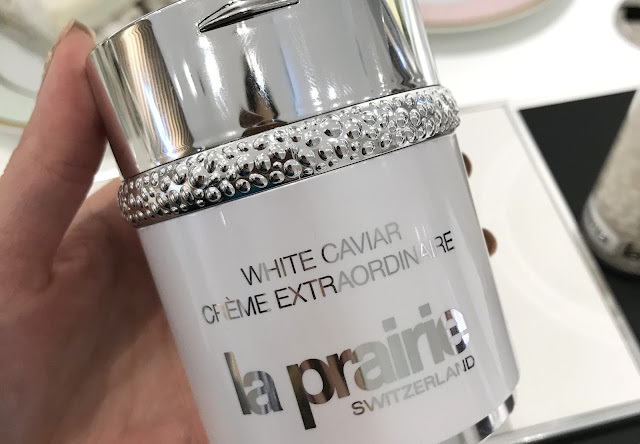 I will be having a White Caviar Facial this weekend so I will be sharing my experience with all of you next week!